I am currently sitting in the NETS-A release celebration at the National Educational Computing Conference (NECC 2009). The NETS are the National Educational Technology Standards written by ISTE, the International Society for Technology in Education. The NETS standards for administrators were created in 2002 and this refresh is a much-needed follow-up to the recent releases of standards for both students and teachers. In a later post I will go further into my thoughts about the necessity of administrative leadership in this area. This is a topic I have tapped on in the past, and will surely be one I continue to explore as we go forth. There is no doubt that carefully articulated transformational standards are needed. What is even more important is that these standards are for not only our students, but for teachers and administrators as well. What do you think about the new standards for leadership in regard to educational technology? Do you think the focus is appropriate? Do you believe they have both appropriate breadth as well as depth? Check out the word cloud (Wordle) above that illustrates the standards. Please click through to view the detail. What do you think this view says? Does this type of view provide a different look from the raw text? Any interesting first thoughts? 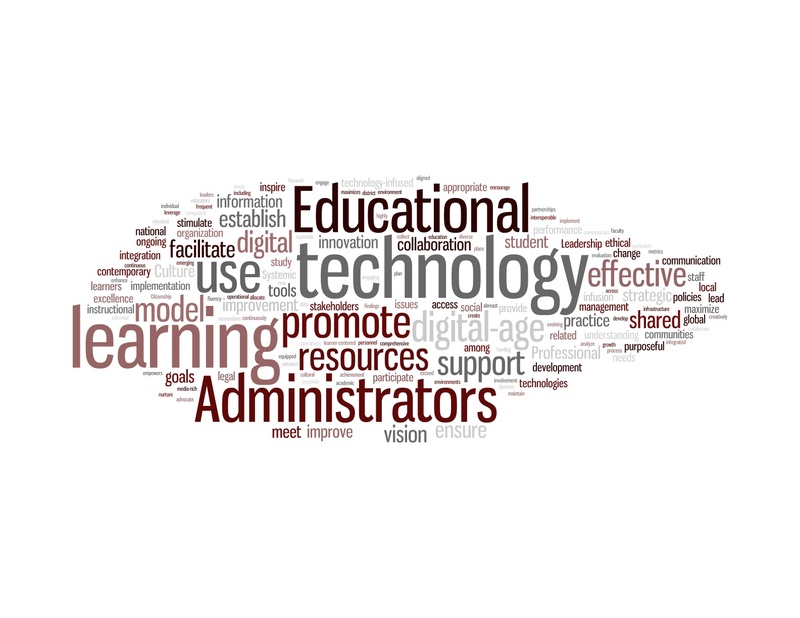 Looking at the word cloud…what struck me was the prominence of the word Administrator along with words like facilitate and support. While that is the way it should be with ed tech in the classroom, so often (especially at my level – elementary) it is not. I’m liking your blog. Found it through Punya – one of my professors at MSU. Keep writing! Hey Beth… thanks for leaving such kind words. I agree with you, administrative savvy and support seem particularly rare in the realm you speak of. No doubt. Here’s hoping these standards get tossed about wide and far, and end up actually rising the tide a bit higher. Consider yourself lucky to have teachers like yours. I’m a bit jealous. I certainly have had some good ones over the years, but not so much in grad school. Your guy there is one creative parallel thinker. Having that personal contact is something you should take full advantage of. Cheers!